The Obama administration deported a record 438,421 unauthorized immigrants in fiscal year 2013, continuing a streak of stepped up enforcement that has resulted in more than 2 million deportations since Obama took office, newly released Department of Homeland Security data show. President Obama today is scheduled to address members of the Congressional Hispanic Caucus, a group that has recently criticized the president on immigration. Last month, the caucus urged the president to take executive action on immigration by extending deportation relief to certain groups of unauthorized immigrants, such as parents of U.S.-born children. Some immigrant advocates have dubbed Obama the “deporter in chief” over the fact that his administration has deported about as many immigrants in five years as the George W. Bush administration deported in eight years. During his speech, Obama is expected to reiterate his pledge to make changes to immigration policy on his own, something he said he will do after the November midterm elections. The record number of deportations comes even as 580,946 young unauthorized immigrants have received relief from deportation and work permits since 2012 under a policy called Deferred Action for Childhood Arrivals. In Pew Research Center surveys, Hispanics have expressed disapproval of the growing number of deportations during the Obama administration. Six-in-ten Hispanic adults in February said the increased number of deportations of unauthorized immigrants is a “bad thing,” while the U.S. general public was divided on the issue. And while 89% of Hispanics in 2013 said they support a pathway to citizenship for unauthorized immigrants who meet certain requirements, a majority (55%) said deportation relief is more important than a pathway to citizenship for this population. Most of the growth in the number of deported immigrants has come from those deported for reasons other than a criminal conviction. In 2013, 240,000 deported immigrants did not have a previous criminal conviction, up from 218,000 in 2012. Meanwhile, the number of deportations of those with a criminal conviction has stalled at around 200,000 for the past two fiscal years. One distinct feature of the record number of deportations is the increasing share of deportations by U.S. Customs and Border Protection after border apprehension. 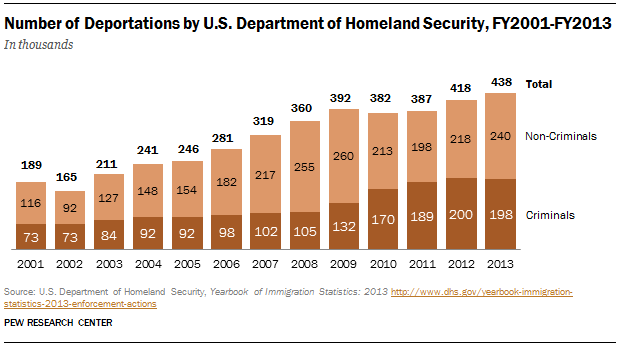 In 2013, 25% of all deportations were carried out by the agency, up from 17% in 2012. Meanwhile, the number of deportations carried out by U.S. Immigration and Customs Enforcement, which deports people caught both at the border and the interior of the country, fell in 2013 compared with 2012. Another change is that in 2013, a record 363,000 (83%) of deportations were carried out without appearing before a judge – either through an order issued by an enforcement agent (called expedited removal) or by using a previous order of deportation (called reinstatement of final orders). This is due to a 2005 shift in policy that has increased the likelihood of being deported after apprehension. This rise in the number of deportations also coincides with stalled growth of the U.S. unauthorized immigrant population since 2009, and a more recent rise in the number of apprehensions at the U.S.-Mexico border. In 2013, there were 414,000 apprehensions at the southwest border, a rise of 27% over 2011 (the most recent low in apprehensions). Also, a new shift in migration patterns emerged over the last two years: more Central American immigrants and unaccompanied children crossing the border. These trends have led to an increase in apprehensions at the U.S.-Mexico border. On the other hand, the number of Mexican immigrants apprehended at the border and the interior has continued to decline from a high of 1.1 million in 2005 to 425,000 in 2013.